One third to one half of Americans are introverts in a culture that celebrates - even enforces - an ideal of extroversion and a cult of personality. Political leaders are charismatic, celebrities bask in the spotlight, and authority figures are assertive. It is no surprise that a quiet revolution has begun to emerge among the invisible half of the population, asserting that they are just as powerful in their own unique ways. 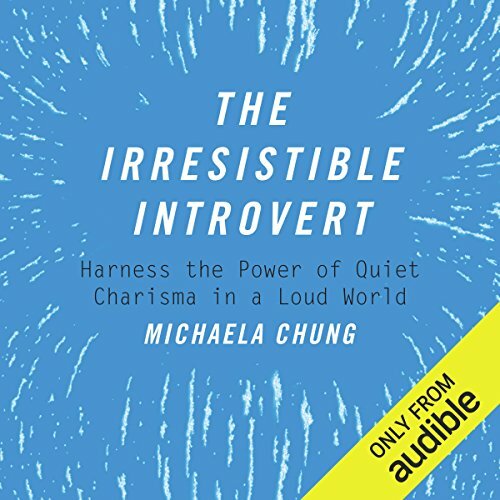 As a professional charismatic introvert, author Michaela Chung demonstrates that you no longer have to forcefully push yourself outward into the world against your nature but can rather magnetize people inward toward the true you. In the process you'll learn to embrace your "innie life" and discover potential you never knew you had. ©2016 Michaela Chung (P)2016 Audible, Inc.
describes me to a tea. felt like the author was inside my head. I enjoyed listening. i am not alone. This book starts off great: it helps you recognize introversion in yourself or others and it offers a lot of anekdotal evidence and examples. I smiled through the first few hours a lot because it was very relatable. Had the book ended there, I would have probably given it 4 or 5 stars. However, about 75% of the book is what I would call a self-help book: how to converse with people, how buddhist and/or hindu principles can help you through life, how to take care of yourself emotionally en energy-wise, and so on. So if you are the kind of person (introvert or extravert) who is indeed extremely socially awkward, who has never had a normal or satisfying conversation in their life, who does not know what to do or say on a date, who has no idea how to take care of their energy levels and, not unimportant, is very interested in buddhist or hindu philosophy when it comes to meditation, mindfulness, what a temple is, etc., then this is the book for you. I am an introvert, but as this book may be viewed as a beginner's guide to introversion and I am no longer a beginner, it is not for me. Also, I'm a christian and the fairly large helping of non-christian spirituality was irksome, since this book was not advertized as such. The narration took a little getting used to as it was a bit slow and sometimes the tone was bordering on snark or even condescension, which I suppose was the narrator's interpretation of the text. I would have given it 3 stars, however I decided to listen to the author on Youtube and found that it is almost exactly as she herself talks. So I guess the narration was pretty well done after all. Personally, I found Susan Cain's book Quiet, the Power of Introverts, far more helpful and would recommend you spend your credit on that. All the more so since Cain had her book out three years before Chung's, which meant that many things I heard in this book were more a rehash for me than new. Bravo Michaela!! Your entire book, cover to cover, fully encapsulates the true introvert experience. There are do many other books out there that generalixe or marginalize introversion, but you paint a realistic picture of what goes on in our minds. This is the ONLY book I've read on introversion that I agree with 100%! Again, bravo! And thank you for taking the time and energy to show the world who we truly are.